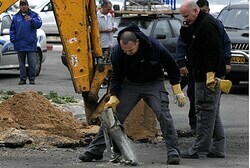 Two rockets landed near an IDF post in Mount Hermon early Saturday morning. An IDF investigation Saturday stated that the rockets are most likely the product of accidental spillover from clashes in neighboring Syria – not a deliberate attack. However, senior security sources told Walla! News Saturday night that the rocket fire may have been a deliberate attack by Hezbollah – and that the IDF has been treating the issue as such. The IDF has been on “high alert” near the Lebanese border since Wednesday, when Hezbollah threatened to retaliate after Israel’s first reported air raid targeting a position of the Lebanese Shiite movement since a 2006 war between them. The terror group vowed revenge on Israel at “the appropriate time, place and means,” according to AFP. “This new attack amounts to blatant aggression against Lebanon, its sovereignty and territory,” the statement claimed. The threat came two days after Israeli warplanes reportedly struck a Hezbollah position in eastern Lebanon, amid fears the region might be dragged into further conflict over the Syrian civil war. The strike took place near the town of Nabi Sheet, a bastion of Hezbollah and the suspected site of a Hezbollah weapons storehouse and training camp. Hezbollah is an ally of Syrian President Bashar al-Assad, and its forces are fighting alongside his against rebels seeking to overthrow him. Israel has not acknowledged the raid, but officials have confirmed a general policy of interdicting suspected arms deliveries from Syria to Hezbollah.